Here's a little fun something I've wanted to document for a while now. 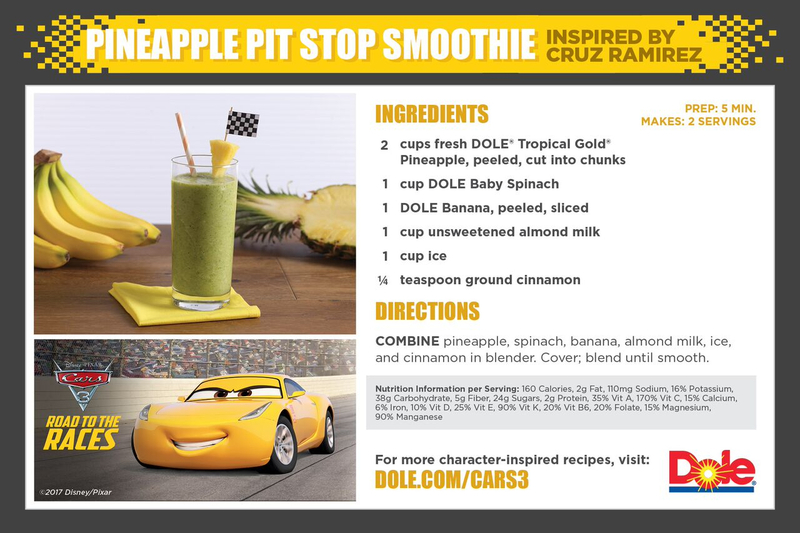 On May 25th, Dole launched their summer 2017 collaboration with Disney·Pixar to promote the release of Cars 3 in theaters and an overall healthy lifestyle. This campaign is dubbed "Fuel Up With Dole" and will run through the entire summer until the end of September. 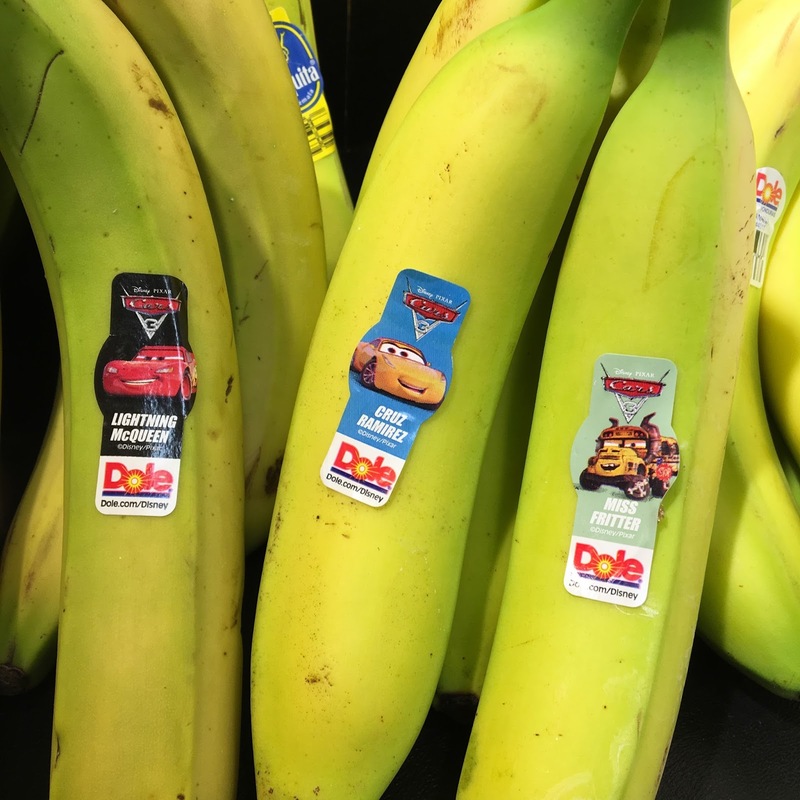 Right now at your local grocery store, you can find specially marked Dole fruits and veggies featuring your favorite Cars 3 characters. 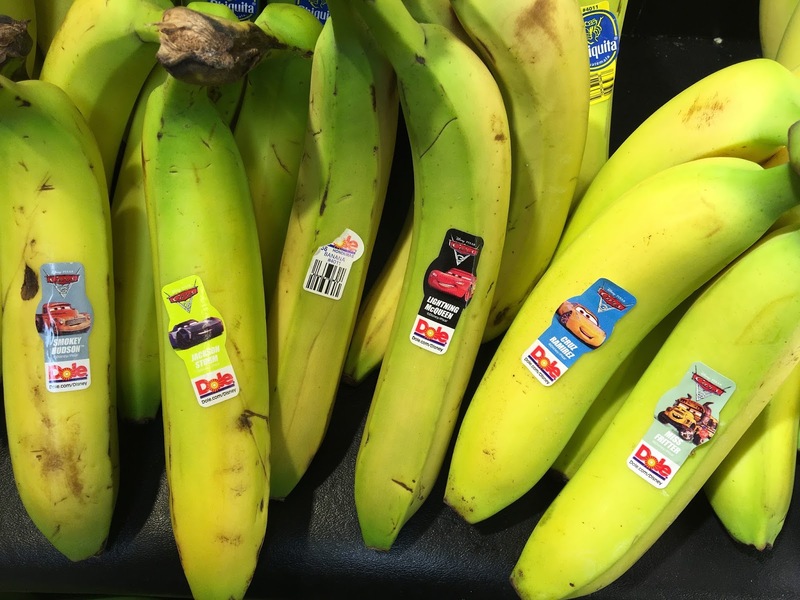 Take these bananas for example; I was able to find all five designs one night: Smokey, Jackson Storm, Lightning McQueen, Cruz Ramirez and even Miss Fritter makes an appearance! You know I had to pick them up. 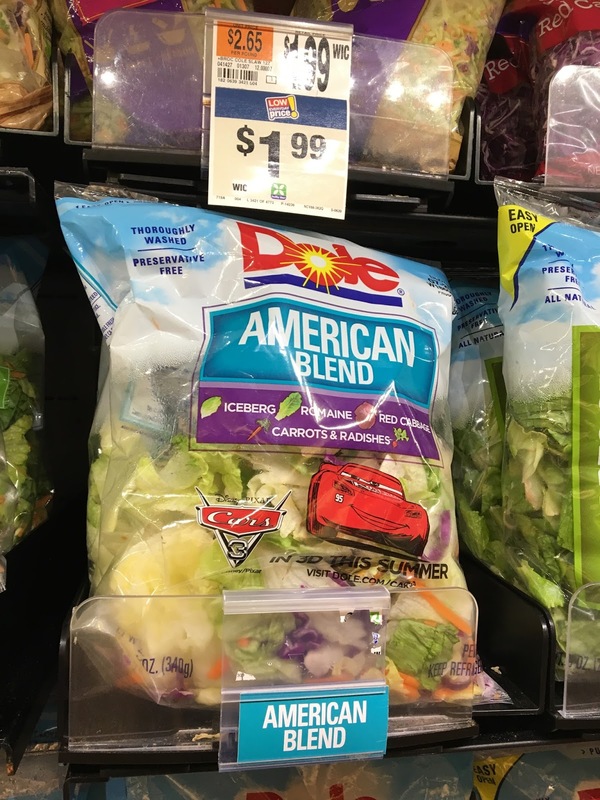 Something else I spotted was this Cars 3 bagged lettuce. I know there are also Cars 3 marked berries out there as well as [apparently] pineapples, cauliflower and celery (which I never ended up seeing near me). 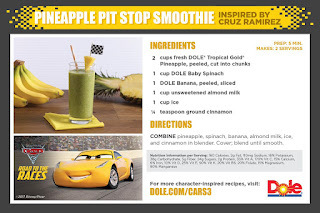 Which Cars 3 Dole products have you seen? 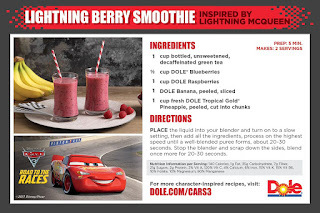 As part of the campaign, Dole also released these healthy smoothie recipe cards, loosely inspired by some of the film's characters. 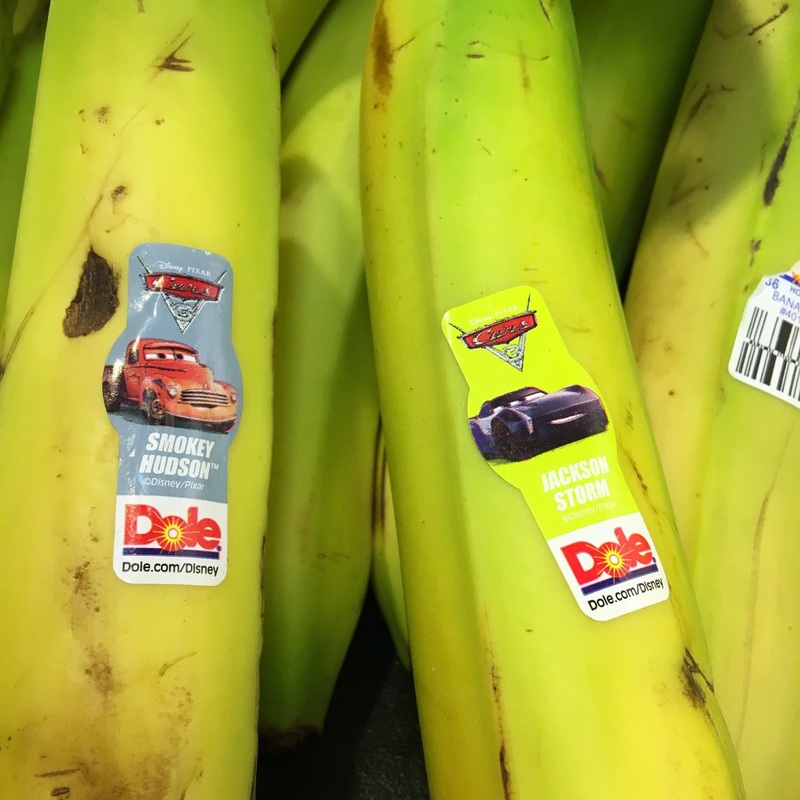 If you went to one of the Cars 3 "Road to the Races" tours, you may have had one of these already (since Dole was a sponsor there was handing out samples). 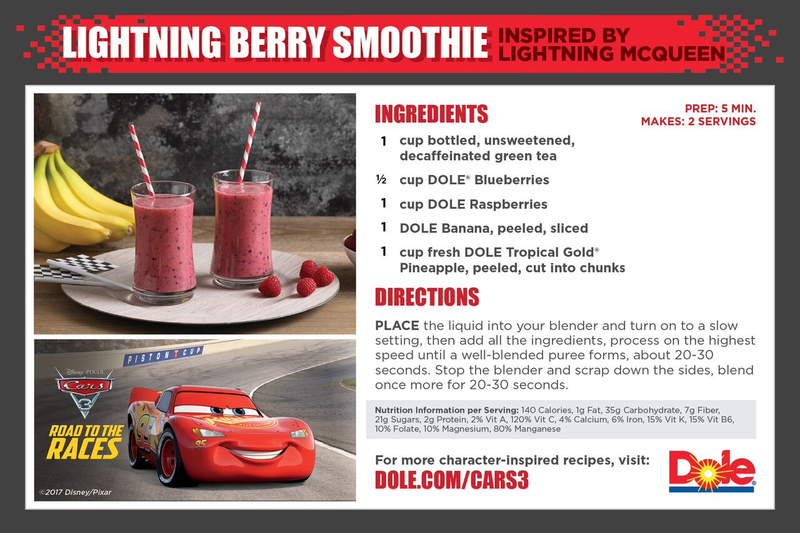 If not, be sure to try out the McQueen inspired "Lightning Berry Smoothie" and/or the Cruz inspired "Pineapple Pit Stop Smoothie" at home and let me know what you think! It doesn't stop there. 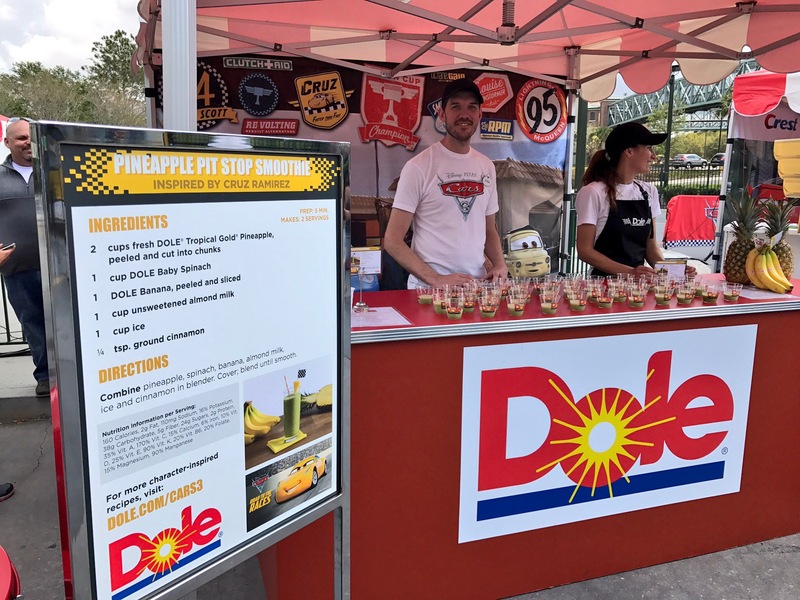 Don't miss out on the other "Race-Ready" recipes featured on Dole's website; including the Crunchy Banana Roll (Jackson Storm inspired), Romaine Mandarin Oranges & Avocado Salad (Miss Fritter inspired) and Buffalo Bites with Chicken & Pineapple (Smokey inspired). Lastly, Dole is sponsoring a big summer "family photo" contest. They're giving away an epic, customizable road trip (through and to any location within the US or Canada) to one lucky family. Just upload a picture of YOUR healthy lifestyle and fill out the entry form and the one with the most creative photo and caption will win! Twenty smaller runner-up prizes will be awarded as well. Find more details and enter HERE. Hurry though! As of this post, the time frame to enter ends in just two days (July 19th). A personalized, all paid for road trip to anywhere I want sounds pretty sweet deal! There you go. Just a little Cars 3 promotion history I wanted to document on here. One day we'll look back and say "oh yah! Cars 3 bananas!" ;) As usual, let me know your thoughts or any questions you might have for me in the comments below.